Guru Nanak Dev Ji, is the founder of Sikhism which began over 500 years ago. Sikh is the Punjabi form of sanskrit, which means a learner or a disciple. There are many followers worldwide, following the teachings throughout Sikhism history. The Gurus (our Gods) taught us to live pure lives, with simple belongs and warm hearts. Sikhism preachers share messages of devotion and remembrance of God at all times and truthful living. Guru Ji (1469-1539 AD), left an important message to the sikh community. He rejected custerism and believed that every religion can work together as one. 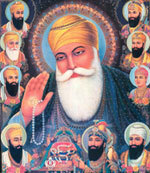 Sikhism is open to all through the teachings of its Ten Gurus. The Sri-Guru Granth Sahib, (our holy book), is used for practice of Akhand Path which is the recital of the entire holy book. It takes about 48 hours to complete. Ardas is a prayer and Wak means open randomly. A prayer is chosen randomly from the holy book, it is a method used to get guidance from Guru Granth Sahib. Click on the picture of Ten Gurus to find out about them. Kirtan, is worship where hymns are sung from the holy book. Karah Parshad, is a sweet dish distributed to devotees at a religious ceremony. The Langar is a free community kitchen. Amrit means Baptism). Nam Karan is a ceremony where the naming of a new-born child takes place and Sikh wedding. Sikh men cover their heads with a Turban, which is treated like a crown. The women also cover their heads with a Duppata. This website gives an introduction to the Ten Sikh Gurus and the eleventh Sri-Guru Granth Sahib, the holy book which is an important part of Sikhism religion. Festivals took place in the Milton Keynes temple. Find out more about these and why Vaisakhi and Diwali is celebrated? Sikhs great each other by saying "Sat Sri Akal or Wahe Guru ji "-which translate as God is the truth.